This is a good book if you are going to appear for SSC exam. 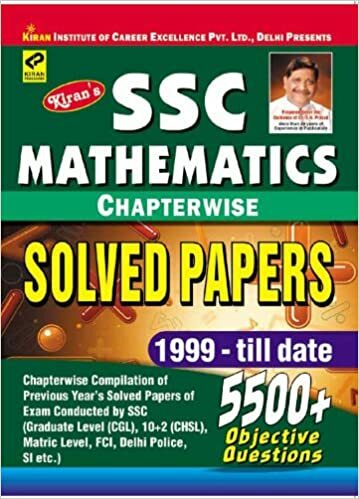 As we know in SSC exams mathematics plays an important role, this book will help you in preparing for mathematics. This book is also available for Hindi medium aspirants. Exams are the assessment, which is held to judge the knowledge, skill, aptitude, physical fitness of a single topic/unit to certify the students based on their performance. GMAT – (Graduate Management Admission Test) is an International level entrance exam, which is conducted 4 to 5 times in a year for the admissions into management program such as Masters in Business Administration, Masters in Finance, etc. This exam is conducted by the GMAC – (Graduate Management Admission Council).This is a computer adaptive test, which judges the candidate's skills including analytical, quantitative, grammatical, reasoning, reading and writing skills. The GMAT is completely an online exam, which can be given by a candidate any time in a year but not more than 5 times in a year. There are more than 500 test centres around the world, where students can select their test centres near to their locality and give their online exam once they are completely prepared. GMAT is available in 115 countries with many test centres. Nearly 20 to 30 thousands of candidates enrol and appear for this exam every year around the country. Candidates can easily register and schedule their exam date and centres through the official site of GMAT. The basic criteria required for GMAT Exam is the minimum age of 18 years and must be graduated from any recognised university. 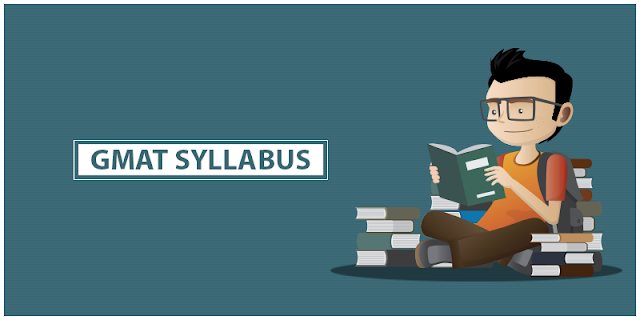 The syllabus for GMAT exam includes Basic English grammar and few topics from mathematics. As per the GMAT exam pattern 2017, this includes 4 section and the allotted time is for 3hours 50 minutes. ● Section 1 - Analytical Writing Assessment Section – In this section candidate should analyse and write an essay of 400-500 words for the given topic. ● Section 2 - Integrated Reasoning Section - In this section, candidates has to use their analytical skills to solve the given problem. ● Section 3 - Quantitative Section – In this section, candidates need to solve few problems related to their secondary school maths syllabus like Arithmetic, Geometry, Statistics, Sets, Percentage, etc. ● Section 4 -Verbal Section – In this section, candidates have to read, understand and answer the comprehension passages questions, write the essay for the given topics and other basic grammatical questions. 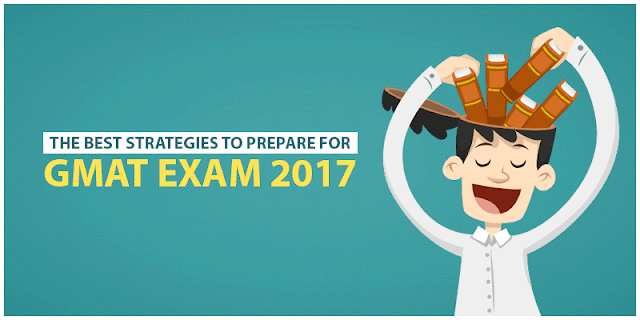 Here are few tips and strategies used in preparing for GMAT Exam 2017. 1. Give an enough time to study, as there will be a lot of study material and important points to cover for which you need sufficient time, so at first, we need to prepare a good time table equally for all the topics with sufficient time. 2. At first, select the study atmosphere in which you feel comfortable to study. 3. Collect all the books for the preparation, including the books for the fundamental and basic concept for specific problems, guide books for GMAT and previous year question papers. 4. Always keep a sheet of paper to make a note of important points, formulae, underline every important point in paragraph or answer so that it will make easy to study and to remember. 5. Always start the preparation with easy and perfect questions and topic as the rate of interest and the concentration will increase. 6. Solve example problems, go through the glossary, tips, key points, points to remember, which will help to cover the chapter very easily and within sufficient time. 7. Prepare a study plan, which will help you to study effectively and will also reduce the stress. ➔ How much study materials you need to cover? ➔ Difficult topics and Easy topics. ➔ How much time is available for each topic? ➔ How many questions are there? ➔ How much important each topic/unit/question is? 9. Divide the study material into several parts so that you can cover the complete material in short period of time. 10. Revise the running notes ,practice the model papers, important questions, practice writing and spend more time in recalling and discussing the topics, answers, definitions, formulae and equations. 11. The practice writing the answers or the equations or the formulae rather than telling orally, as writing will help one to remember the important points and also improve the spellings, grammars and also the handwriting. 12. Practice of writing answer under exam conditions, without any break. So that we can know and manage our time limit for each question. 13. GMAT is the toughest examination, which needs more practice and preparation. Question asked are really tricky and time-consuming, hence students need to be faster in answering the questions. If you are confident with your preparation try to focus on your goal to achieve it. To clear this exam lot of preparation is required. Need to refer more and more books, question banks, model papers and previous year papers. About the Author: Sushma.S is presently working as a content writer at Byju’s. She is specialised in writing and delivering content with keyword planner and free plagiarism. She has created more content for the blogs and for another forum.